400+ designs, across 3 sizes, all printed on our highest quality Ultra White Satin 270gsm Poster paper! Add a splash of sophistication to your room with these classy framed photo posters. Frame your photos with these fancy frames available with Gold, Silver, and Black. 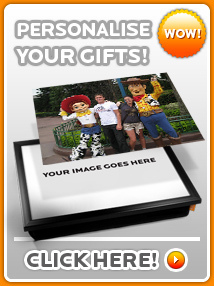 Personalise your poster with your own photos for that super special gift. Simply upload your photos in the Browse field and click 'Add To Cart' to start the upload. Make sure to choose the frame colour for each of your photos too! Bear in mind that the frames are square in shape so ideally your photo's subject should be fairly central so that we can crop accordingly. Do get in touch if you have any questions or email over your photo to info@kicoproducts.co.uk and we'll check them for you. Choose from hundreds of our ultra fine art prints to decorate any room or office. We use the best Ultra White Satin poster paper with a top weight of 270gsm (Grams Per Square Metre) to give a very substantial feel to your print. Available in 3 sizes, A4, A3 and A2 which can all feature either a 5mm, 20mm or no white surounding border. These prints are ready to hang or frame yourself and will be delivered rolled up in a cardboard tube for safe transit. Alternatively we can also frame the prints for you in 3 different sizes, simply search 'framed prints' above. You also have the option to personalise your own fine poster print by uploading your own artwork or photographs, simply search 'personalised poster' above.